Can I take prescription medications with me ? The Turks and Caicos Islands are a British overseas territory consisting of two groups of sub-tropical islands in the West Indies – the larger Caicos Islands and the smaller Turks Islands. The islands are known for tourism and as an offshore financial centre. The Turks and Caicos Islands are situated about 970 km southeast of Miami in the United States, and 80 km southeast of Mayaguana in the Bahamas, and have a total land area of 430 km². Geographically, the islands are contiguous to the Bahamas. However, politically, they exist as a separate entity. The islands have a total population of about 30,000 and approximately 22,500 people live on Providenciales in the Caicos Islands. Cockburn Town is the capital, situated on Grand Turk Island. According to recent statistics, the leading sources of tourists arrive from the United States and Canada. Though not typically known as a shopping mecca, the Turks & Caicos Islands do offer some excellent buys. There, shoppers soon discover that there is no sales tax, nor luxury tax. So, many bargain items, such as jewelry, watches, cameras, perfumes, crystal, china, cigars and liquor can be found. The island's most popular sports are fishing, sailing and soccer. Hot and dry tropical weather. Providenciales is a 25 mile long island in the Turks & Caicos Islands. Fondly called Provo, it belongs to an archipelago of eight major islands and numerous uninhabited cays located at south of Miami and southeast of the Bahamas. 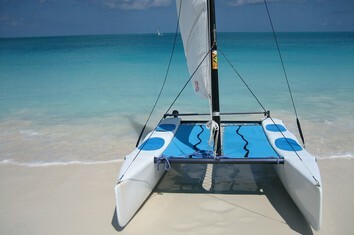 It is famous for it's 12 mile Grace Bay Beach which is rated among the top ten beaches in the world. Located only 80 minutes by air from Miami, The Sands at Grace Bay feels like a world away. The perfect beach, spectacular views, spacious and beautifully appointed suites make The Sands at Grace Bay the perfect combination of seclusion and sophistication. Salt Cay is a small island in what is called The Turks Islands. Once a thriving salt producing island, the island has today stopped the march of time since the sixties. Now home to about 80 Belongers who retired from the salt industry, and a growing number of expatriates from all over the world, Salt Cay now thrives on tourism. Cockburn Town is located on the largest island in the Turks Islands archipelago, Grand Turk Island. Historic 18th and 19th century Bermudian architecture line Duke and Front Streets in Cockburn Town. The town is known for its long, narrow streets and old street lamps. This park protects 15mi/24k of underground caverns, one of the largest cave systems in the Caribbean region. Some have lagoons and stalactites and stalagmites and most have colonies of bats. They were used as sacred sanctuaries by the Lucayan Indians, who left petroglyphs on the walls. One of the most photographed places on the Turks and Caicos, Mudjin Harbour is a half-moon lagoon with breathtaking limestone cliffs overhanging the sandy expanse of beach that links up to an off-shore cay. A National Historic Site, your charter boat captain can point out cannons lying on the ocean bottom in three or so feet (1m) of water that were once poised to protect Loyalist plantations in the Caicos Islands. The largest island in the Turks & Caicos chain, Middle Caicos has an area of 48 square miles. It is a very lush island suitable for agriculture. From medicinal herbs to majestic fruit trees, Middle’s form of agriculture is a cultural feast to behold: Cassava, okra and guava, tamarinds, sapidillas and sugar apples, to name just a few. But the cornerstone of their crops is corn. Bamboo Gallery Ltd was founded in 1990, by Titus de Boer, in Providenciales, Turks & Caicos Islands, making it the first professional art gallery in the country. Bamboo Gallery is the art center of the Turks and Caicos Islands. Special emphasis is given to young Turks & Caicos painters. Pine Cay, a privately owned 800 acre jewel in the Turks and Caicos Islands, is home to this unique and exclusive resort. One can enjoy the romantic Sand Dollar Cottage, or one of the privately owned rental homes scattered unobtrusively about the island along with a fine cuisine, always including fresh seafood.